On a ridge high above the Potomac River, strategically located just 15 miles south of the Nation's capital, sits the stronghold of Fort Washington. Its imposing stone face silently watches the river now, as it has for almost 200 years. Completed in 1824, Fort Washington represented the cutting edge of American seacoast protection throughout the turmoils of Civil War. The turn of the century brought high tech steel and concrete Endicott batteries, but the advent of the aircraft finally cast the old fort into obsolescence by the 1920s. Its service not yet completed, Fort Washington served as an infantry post and training center until the end of World War II. 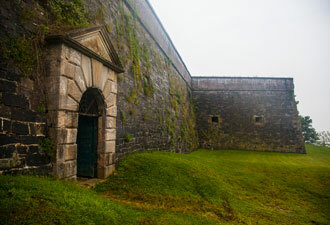 Since 1946, the stately fortification has enjoyed a comfortable retirement as a national park. All however, is not completely quiet. “Cannoneers—Post!” snaps the gun crew to attention as a crowd gathers around the Civil War-era cannon inside the fortress's stone walls. “LOAD!” is exclaimed moments before the powder is rammed home. The charge is set, the crew is ready, as visitors cover their ears anticipating the final command…“FIRE!” The ramparts and river echo with a massive “BOOM” as smoke and fire roar from the cannon's barrel. Finally, cheers and applause erupt. 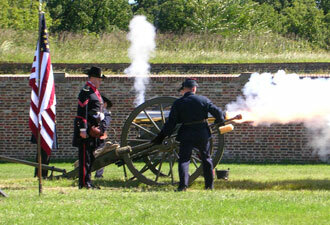 Fort Washington Park makes history come alive with artillery demonstrations on the first Sunday of every month from April to October. 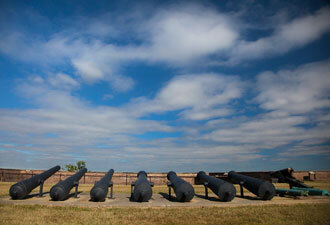 Forts and cannon are not the only highlights to discover. Just outside the fort, along the shore Fort Washington's lighthouse still flashes its warning signal. Originally constructed for only $500 in 1857, this is one of the park's most popular attractions. As summer closes, hundreds of maritime enthusiasts seek out the Fort Washington Lighthouse as a featured stop on the Maryland Lighthouse Challenge. A two-day driving tour along the Chesapeake Bay, this bi-annual September event highlights Maryland's maritime history, visiting ten historic lighthouses in some of the most scenic areas of the state. More than 341 acres of meadows, riverfront, and woodlands await the outdoor explorer. Any birder would delight in the more than two hundred species that can be observed here. Osprey and bald eagles soar high above the fort, while in the nearby trees robins and woodpeckers zip about. Any visit would not be complete without hiking the river trail. This three-mile trek winds along the shore to an intimate wetland cove where you're sure to surprise a few mallard ducks or possibly a great blue heron. Fort Washington offers wildlife of the furry variety as well as the feathered. The occasional fox patrols the parade grounds, groundhogs scamper around the riverfront, and deer graze the hills. The months of summer, from May through August have the highest park visitation with more than 350,000 visitors each year. In early fall the crowds subside, temperatures cool, and the leaves start to turn—making this one of the best times to visit. Fort Washington Park is always a favorite picnic spot with locals, with many fee and free picnic areas providing tables and grills for families and groups to gather. The park remains open daily until dusk, and evenings are always bustling with visitors walking dogs, jogging, or out for an evening stroll. Come and connect with our nation's history and Maryland's beauty at this hidden gem along the shores of the Potomac River!